Our elegant porcelain tea cup ensemble is one of our signature service items. The custom cover keeps tea hot while revealing the leaf of our pyramid infuser. 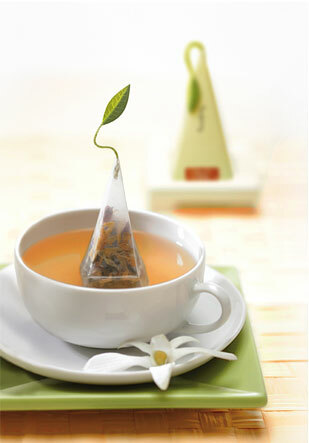 After steeping, remove the lid to enjoy a piping hot, aromatic cup of tea. Each cup is beautifully packaged in a handcrafted wooden box. The cup holds 8 oz. I must say that I have about 10 Tea Cups that I use often and a few accessories but I am more into purchasing and obsessing about the actual tea than the tea accessories or other products. This Cafe Cup from Tea Forte’ is starting to change my mind about that. I received it perfectly – and I mean PERFECTLY – packed in an attractive wooden box. Upon opening the box it was very carefully wrapped in matching green tissue paper. Everything was safe and sound. I started unwrapping the contents and first saw the cover and then saw the cup. Both are bone white in color and lightweight. I’ve always been a “tomboy” and never very “Miss Prissy” but holding this cup and sipping my tea from it made me feel…well..dainty. The Bone White color of the cup is perfect for those who are intrigued by the liquid color of the tea or for those reviewing tea like me. You can see the actual color very clearly. The first time I sampled tea in this I did steep a Tea Forte’ pyramid bag in it…White Ginger Pear…as a matter of fact. I used the lid and stitched the trademark Tea Forte’ leafy string thru the top. It held the pyramid bag perfectly in place…even while transport from the “hot water location” to my desk. Now…I’m not always the most graceful person and did notice that the tea sloshes around in the cup fairly easy. I’m not saying this is good, bad, or indifferent, it’s just something I noticed. I was showing a friend of mine this little gem and he asked me if it came with a coaster. I thought to myself…self I thought…I bet I could use the lid as a coaster…and so I did!! I don’t think this has ever been recommended but I did it anyways and I will say that it worked out nicely. 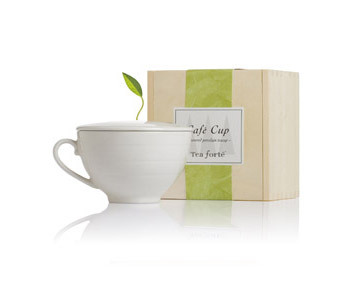 I really like this Cafe Cup from Tea Forte’. I really had no idea I would have this much to say about it, but apparently I did. If you ever come across one of these – check it out!